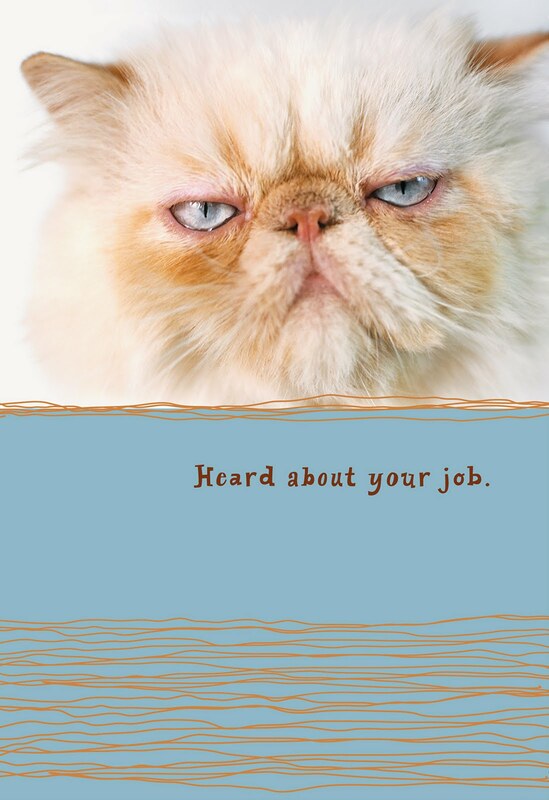 In a world where you can buy greeting cards for everything, including "Christmas Wishes To You and Your Cat," it should come as no surprise that Hallmark recently announced a new line of encouragement cards that take on some of life's more depressing circumstances, such as job loss. When I first heard about the collection, I was a little skeptical. I mean, if I lost my job, no card in the world would make me feel better. What it amounted to was a company trying to make money off of the fact that I was no longer making money. Hey! However, after viewing some of the cards, my mind changed a little bit. Aren't cards supposed to express what we ourselves cannot always say? And isn't it unexpected events like illness and layoffs when it's hardest to find the right words? While there are a few of the requisite "earnest" sentiments to be had, most of the greetings skew lighthearted, and I must admit that the cat card in the bunch even made me laugh. The cat is grumpy and flat-faced enough to be cute but not "cutesy," and the message is funny without being cheesy and overbearing. Sure, the simple act of sending a greeting card doesn't make a situation like this any better, but it symbolizes a silent gesture of support during a difficult time in someone's life. Kind of like, "I'm here for you," minus the awkward conversations and clichéd platitudes, that in the end usually end up making no one feel any better. I think this is just great! I lost my job in 2007 due to downsizing and I frankly would have loved this!